Earlier this month a note from the late Queen Mum to her assistant asking him to “pack the gin” sold at auction for $32,000 US. Dorothy Parker’s relationship with the spirit is more associated with speakeasies and bathtub stills. Originally medicinal in origin when first created in Holland in the 17th century, by the 20th century, gin was a flavourful and unique beverage consumed by sophisticated people, the most notable of them women. 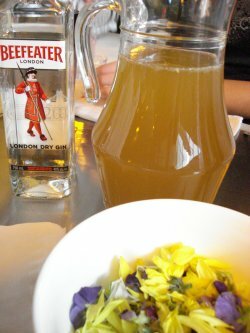 During the 30 Years War, British troops took a liking to the “Dutch courage” and brought it back to Britain with them where distillers continued to sell it for medicinal purposes, and individuals made it at home, with estimates of 1/3 of all homes at the times creating their own gin, which was said to be very bad. The spirit was popular among the poor, including children, and was the cause of rampant addictions and alcoholism. King Charles 1 passed the gin act which regulated producers, created a better quality product and used surplus corn and barley grown by English farmers. All gin, both Dutch and English, starts with a plain neutral spirit and is flavoured with juniper berries – the word “gin” comes from the Dutch word genever, for juniper. The Dutch gins available today tend to be sweeter and highly flavoured, with a spirit base from cereal grains (corn, rye, barley malt) and are produced by immersing the botanical mixture directly into the grain mash prior to distillation. British or London gins, may be made from grain or cane sugar (molasses) and are drier, making it much more versatile for mixing. Individual producers determine the other flavour components which may include other botanicals such as angelica root, anise, coriander, caraway seeds, lime, lemon and orange peel, licorice, calmus, cardamom, cassia bark, orris root, and bitter almonds. Hendrick’s gin, which is made in Scotland, includes cucumber and Bavarian rose in their distillation process, making it particularly unique. 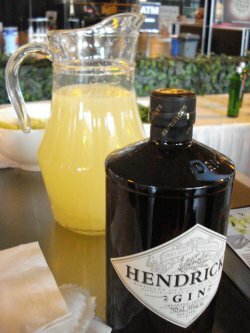 As part of their summer cocktail promotion, the LCBO is encouraging spirit drinkers to branch out and try new varieties of gin. At the Drinks Show that ran this weekend, a separate gin-tasting area which featured 9 different brands of gin, was one of the most popular spots at the event, despite the spirit’s reputation for being strong and hard to drink. In fact, with so many varieties of gin, all with their own unique flavour profile, it’s actually a much more interesting and versatile ingredient in cocktails than vodka, which is so neutral it’s boring. Gin works well with fruit and citrus; at the Drinks Show we tried a cocktail made with Bombay Sapphire, strawberries and vanilla; staff at the Beefeater booth mixed a cocktail with raspberries and lemon juice; we loved the mojito made with Bulldog gin, and Tanqueray offered a Martinique with fresh lime and guava juice. Because of the spices and botanicals, gin mixed with a sweeter element like fruit can be smooth and refreshing on a hot summer day. 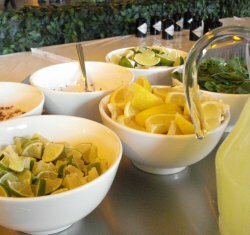 Gin also works well in cocktails with a less sweet flavour element, such as the cocktail offered by Plymouth gin with crushed basil and lime; or the offerings from Hendricks that combined the cucumber-flavoured gin in a mule with crushed cucumber and ginger beer, as well as another cocktail mixed with lemongrass lemonade. 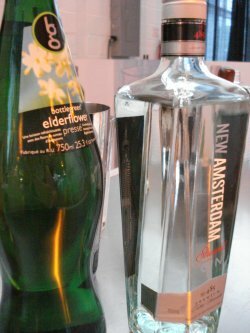 Ontarians seem to like the London Dry style of gin, as all but one of the gins on offer both at the Drinks Show and in the LCBO promotion was this style, although we were very much impressed with the Dutch style New Amsterdam Straight Gin, made in Modesto CA. This gin is sweeter than the English-style gins, with strong malt notes and lots of candied citrus and pepper flavours. We tried this in both cocktails on offer (one with watermelon, the other elderflower) as well as straight, and enjoyed each immensely. Gin has a notorious and colourful past. It epitomizes the cachet of cocktail culture from the original martini (no… no… that travesty made with vodka is called a Kangaroo), through the roaring 20s and the New York speakeasy scene, and even finds popularity amongst royalty. It is, by far, one of the most interesting spirits available, each brand having its own personality and its own fans. “Pack some gin – in case it is needed.” Or just because it tastes great.